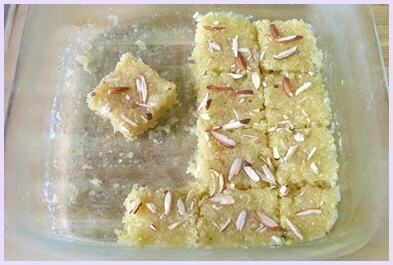 Kopra pak recipe – This Gujarati style of making coconut burfi. 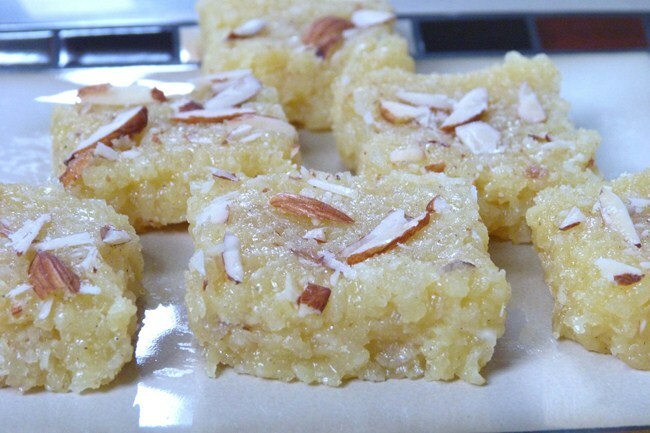 This sweet or mithai is made from freshly grated coconut, sugar, milk and mawa. This is the EASY recipe. Dump all in the pan and cook till it gets thick and lumpy. Then set in the pan to cool. Then cut into pieces and eat. This cannot be simpler than this. 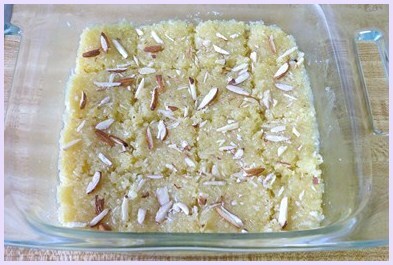 Basically this is nothing but the coconut burfi. There is another way of making it which call for one string consistency of sugar syrup. This method is little tricky for beginners, so try this simple kopra pak recipe. 1) Grease 8×8 inch pan with ghee and keep it aside. 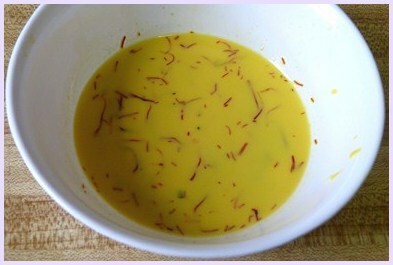 2) Take saffron and 1 tablespoon milk in a small bowl. Warm it up in the microwave for few seconds. And then rub saffron between your index finger and thumb. So it gives nice yellow color. Keep it aside till needed. 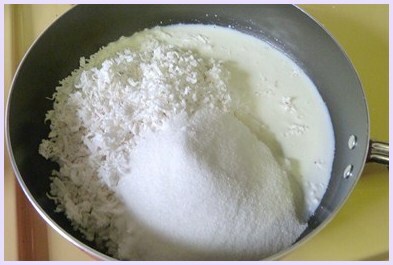 3) Take coconut, sugar and milk in a pan. 4) Mix well. And turn on the heat on medium. 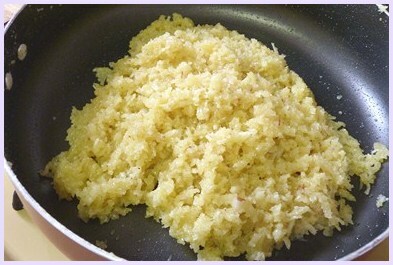 5) Cook it for 15-17 minutes with stirring continuously. 6) Cook it till all liquid evaporates. 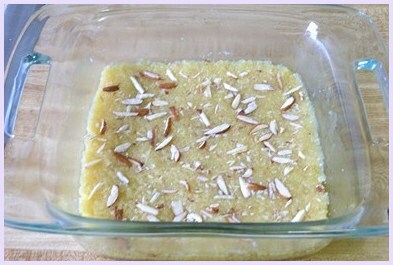 7) Then add saffron-milk mixture, cardamom powder and khoya. 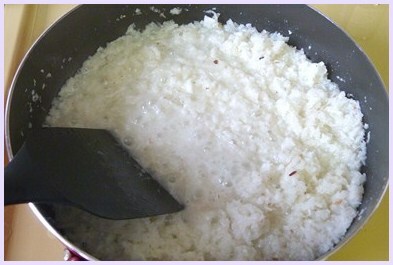 9) Cook it for 10 minutes with stirring continuously. It should look sticky, dry and lumpy when done. 10) Transfer to greased pan and spread it evenly. Top it up with sliced almonds or pistachios. Press nuts little bit so it sticks to burfi. 11) Let it cool completely. Then divide it into 16 equal pieces. 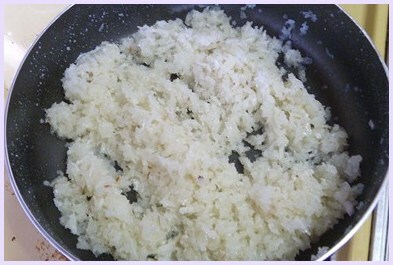 12) Remove it from pan gently without breaking it. Store in airtight container, it stays good for two weeks in refrigerator. Serving suggestion: you can serve it as a sweet accompaniment (1 piece per person) with your meal on festivals like Diwali, rakshabandha, holi and many more. 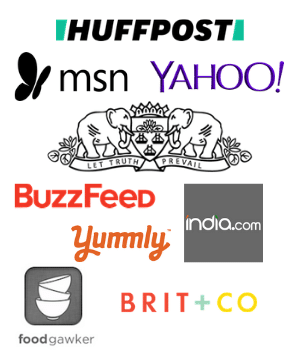 Some people pack this as a gift and give it to relatives or friends or to their loved ones on New Year day or Diwali. Grease 8x8 inch pan with ghee and keep it aside. Take saffron and 1 tablespoon milk in a small bowl. Warm it up in the microwave for few seconds. And then rub saffron between your index finger and thumb. So it gives nice yellow color. Keep it aside till needed. 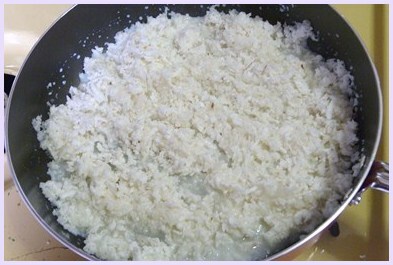 Take coconut, sugar and milk in a pan. Mix well. And turn on the heat on medium. Cook it for 15-17 minutes with stirring continuously. Cook it till all liquid evaporates. Then add saffron-milk mixture, cardamom powder and khoya. Mix well. 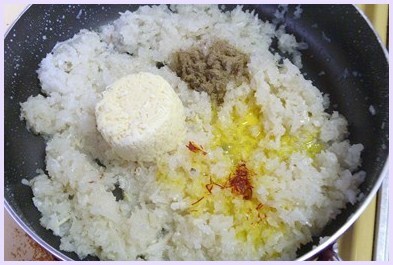 Cook it for 10 minutes with stirring continuously. It should look sticky, dry and lumpy when done. Transfer to greased pan and spread it evenly. Top it up with sliced almonds or pistachios. 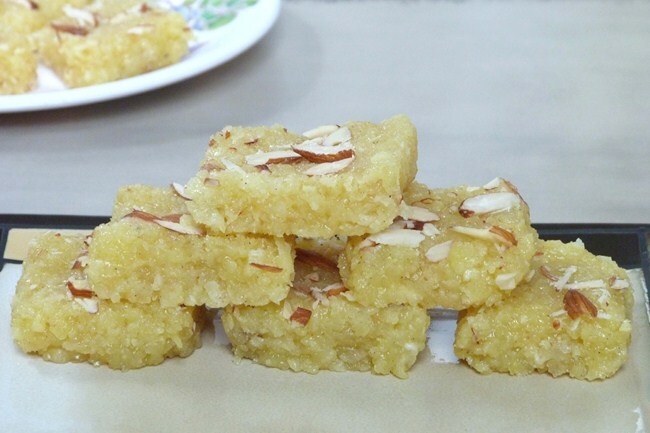 Press nuts little bit so it sticks to burfi. Let it cool completely. Then divide it into 16 equal pieces. Remove it from pan gently without breaking it. Yes you can use almond or cashew milk instead of regular dairy milk. 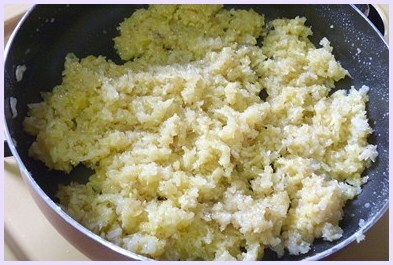 And use 1/4 cup of cashew powder in place of khoya.